I've been playing Reus for one week now and had a great moment doing it. 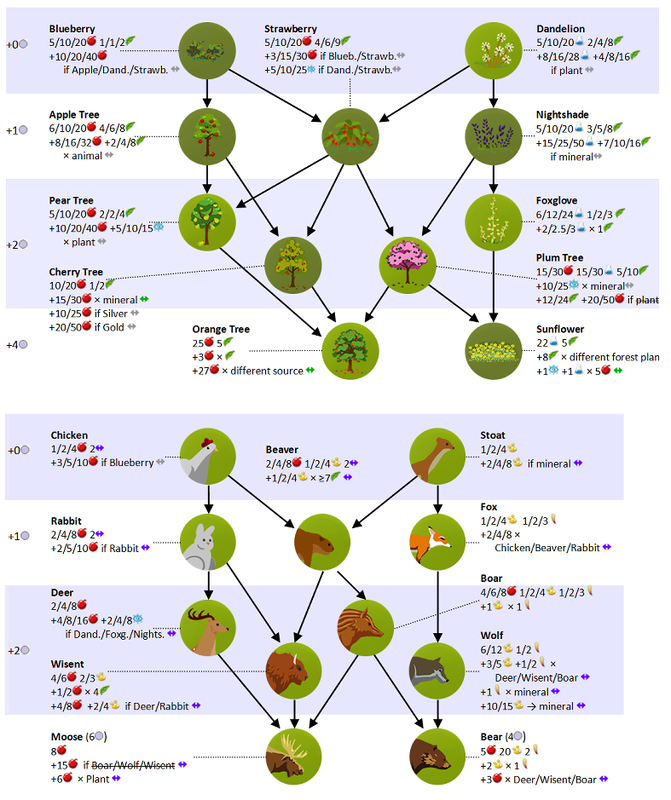 I don't know how you play it, but lately, i've been annoyed to spend my time alt+tabing to read wiki.reusgame.com or to look at the annotated diagrams HaRLeKin uploaded there. Are you doing the same ? Did you already learn every possible combination of natural sources ? I was wondering if there was some kind of printable cheat sheet to help me out. So, since i didn't found one yet, I started to write mine, based on the available information on the wiki and the previous work from HaRLeKin. This is nice, the style of indicating symbiosis is nicely concise. Perhaps you could consider indicating the aspects required for the various upgrade paths? A colour coding of arrows might work and require a set of only four colours to be assigned. I started to put aspects icons to the diagrams. Apparently there is no uploaded image on the wiki with the couloured aspects. But I like your idea to put the colour on arrows. Thank you.